Diabetes causes systemic damage and can really impact every part of the body, including the skin on your feet. In fact, skin problems are sometimes even the first sign a person has diabetes. It’s estimated that as many as one-third of diabetic individuals will have a skin issue either caused or affected by the disease at some point in their lives. Fortunately, most of these conditions are easily treated if caught early. Even better, many are preventable if you take the right diabetic skin care measures. Keep your diabetes well-managed. People with high glucose levels tend to have dry skin and less ability to fend off harmful bacteria. Both contribute to increased risk of infection. Keep skin clean and dry. Microorganisms like fungal spores and bacteria need moisture to survive. Completely drying your feet off before putting on socks and wearing moisture-wicking socks are ways to deny them the water they need. Prevent dry skin. Whereas too much moisture is bad, so too is skin that is too dry. Excessive dryness causes skin to crack, which then increases the risk of infection. Moisturizing the tops and bottoms of your feet can be beneficial. Avoid very hot baths and showers. Moisturizing soaps may help. Afterward, use a doctor-approved skin lotion, but don’t apply it between your toes – extra moisture in those areas can encourage fungal growth. Treat cuts right away. Wash minor cuts with clear, running water. Do not use soap—even antibacterial kinds—as this may cause irritation for the wound. Apply antibiotic cream or ointment and then cover the minor cut with a fresh, sterile bandage or gauze. If the cut (or other kind of wound) is severe, seek immediate medical care. During the cold, dry months, keep your home more humid (to prevent skin—especially in the bottoms of the heels—from becoming cracked and fissured). Depending on your particular situation, you may benefit from bathing less often during this time of year. Use a mild soap or body wash. Harsh soaps can irritate the skin and potentially lead to bigger problems. DO NOT try to resolve skin problems on your feet—like calluses, warts, and ingrown nails—by yourself. Instead, come see us at our Bloomington, IN office and have the work done in a safe environment by a trained medical specialist. 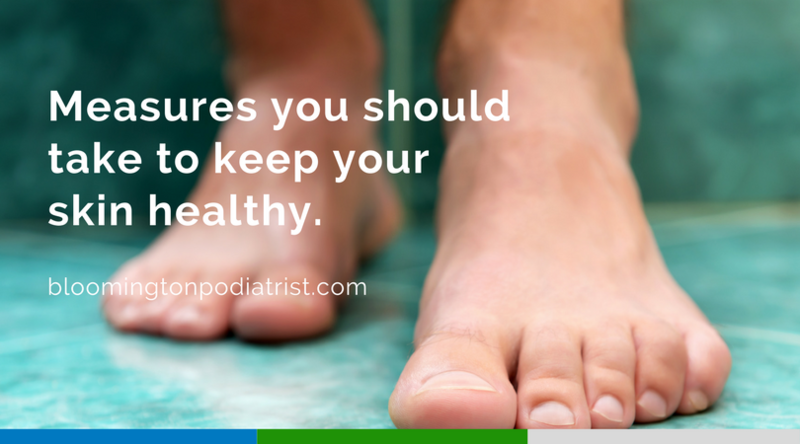 Take good care of your feet. Check them every day for sores and cuts. Wear broad, flat shoes that fit well. Always check your shoes for foreign objects before putting them on. Do not hesitate to contact us if you have any questions or concerns. Remember, we are here to help you with any foot or ankle condition, especially when diabetes is in the picture! For more information—or to schedule an appointment with our office—give us a call at (812) 333-4422.